Hair thinning affects men and women all over the world for varied reasons. The female pattern hair loss can be strongly influenced by age, nutrition, stress, surgery, medications, illness, social/lifestyle factors, hair care and more. As hair follicles weaken and stop producing hair, hair loss occurs. In men the hair loss follows a very specific, progressive pattern that is passed on through heredity and is triggered by hormone–specifically dihydrotestosterone or DHT. As hair follicles miniaturize and weaken, coverage of the scalp diminishes leaving thinning or balding areas. 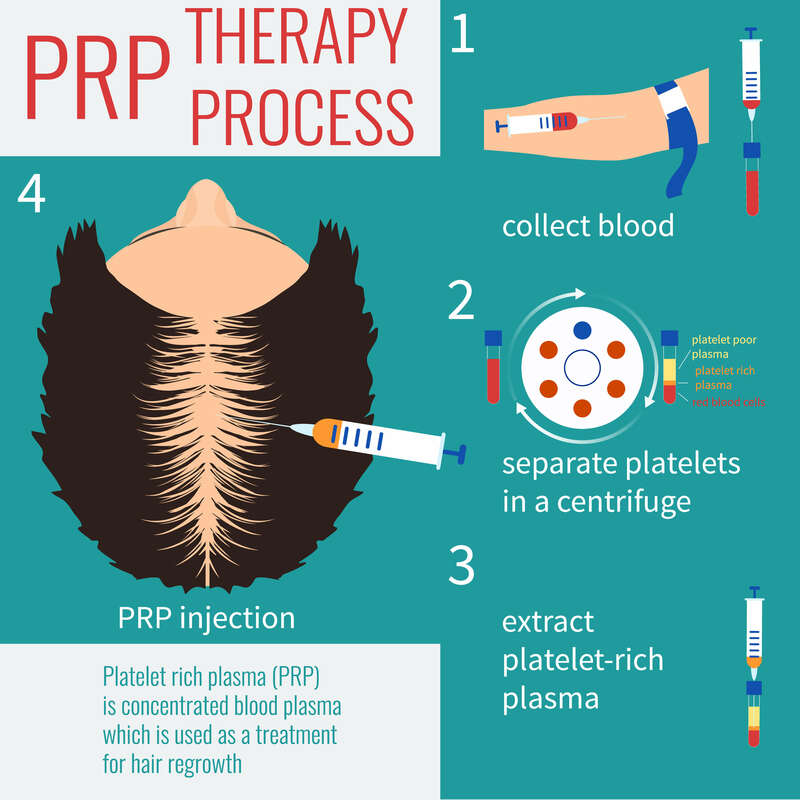 PRP Platelet Rich Plasma is a ground-breaking Hair treatment derived from a person’s own blood platelets to enhance hair growth as a stand-alone treatment or to improve the recovery and results of hair transplant surgery. After the area of concern is identified, evaluated and measured, special gentle and sterile techniques and equipment are used to separate and concentrate the platelets and plasma from a small sample of peripheral blood. A small sample of the blood and PRP is tested in a haematology analyser to measure and document the improved platelet concentration. The scalp is prepared with antiseptic solution and anaesthetic (a “ring block,” not simply local anaesthetic gel) is used to completely numb the scalp for a 100% painless procedure. Small injections of the PRP deliver the powerful platelet-derived growth factors into the skin at the level of the weak follicles. Electronic, mechanical micro-needling is performed. A session of Low Level Laser Therapy is performed before the patient leaves the office. PRP used in this procedure contains growth factors and cytokines that have been shown to be responsible for stimulating and enhancing hair follicle function. There is no activity restriction after a PRP treatment. Patients may shower/shampoo/condition their hair normally just several hours after the treatment and resume normal daily and athletic activities. Some brief mild inflammation noticeable as redness/pinkness and numbness of the scalp may be present for several hours. No harsh chemical colouring or perming treatments should be performed for at least 72 hours. Hair growth improvements can typically be measured in about three months, but it takes six to twelve months to visually see the difference in photos and in the mirror. A PRP hair regrowth treatment visit takes about one hour and may be performed as a lunchtime procedure, as there is no recovery or downtime. 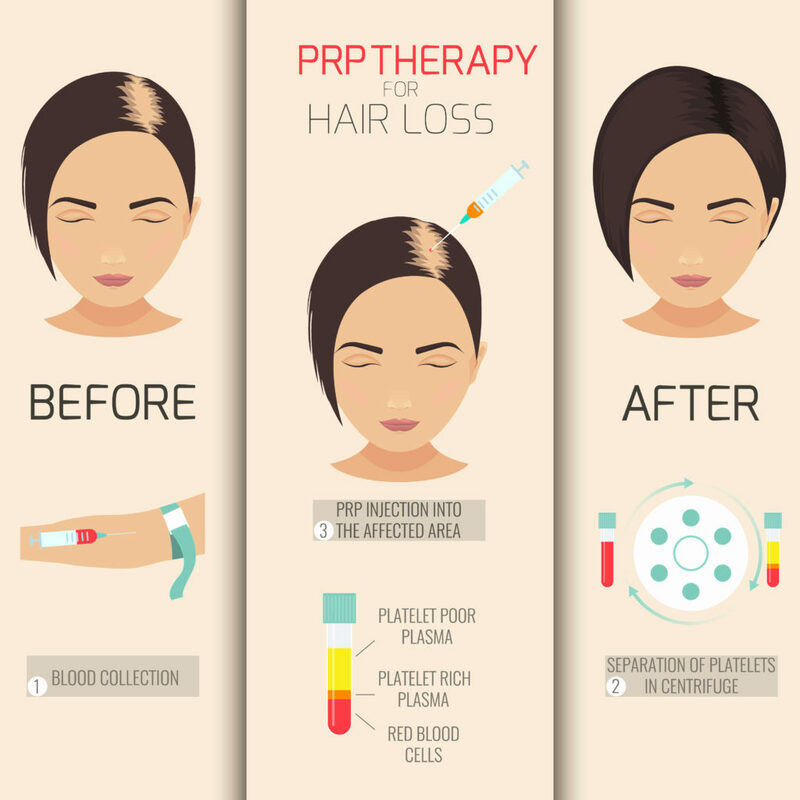 PRP tends to improve hair calibre and hair growth for about four to six weeks, requiring multiple repeated treatments as often as every other month. On average, however, most patients will require their repeat PRP treatment after an average of one year in order to maintain the hair growth effects. It takes six to twelve months to judge the results of PRP “visually” in the mirror or with standardized photos. Measurements are taken every three months, so the plateau phase of improvement can be tracked. When Hair Mass Index starts to decline, the patient’s next PRP is planned. Patients with areas of weak quality hair growth on the scalp, where functioning hair follicles can still be observed, are ideal candidates. We are pleased to offer and arrange comfortable lodging, restaurant, and commuting to ensure a memorable pre-and post-surgical experience for our out-of-country patients. Please feel free to contact the Counselor for assistance with any of your travel and planning needs.